This article explores how new boiler prices are presented by stockists and some of the challenges of comparing prices of the same boiler with different stockists (and even with the same stockist). It focuses on the boiler unit itself, rather than the other components (controllers, radiators, pumps etc) and labour to fit them. To read about the full costs of a replacement boiler read: A guide to gas boiler replacement costs. Before each of these issues is explored, lets briefly look at the gas boiler supply chain in the UK. 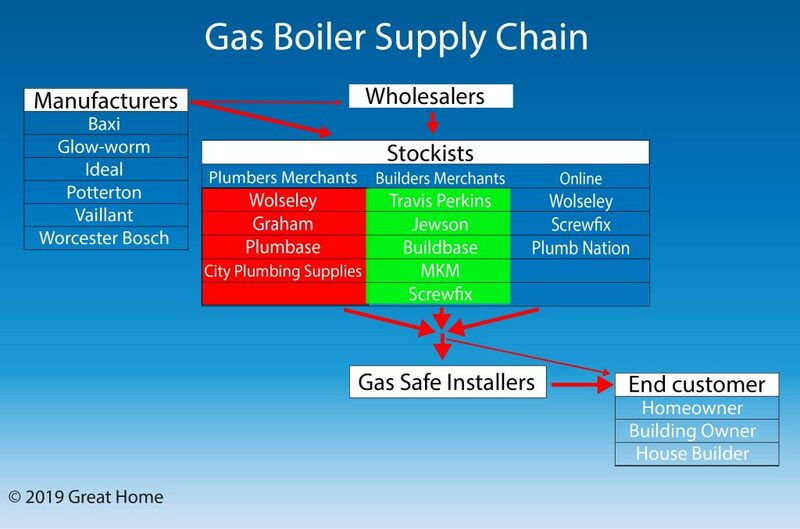 Figure 2 shows how the supply of gas boilers flows from manufacturer to homeowner. The major boiler manufacturers use plumbers’ merchants (eg Wolseley), builders’ merchants (eg Travis Perkins) and online suppliers (eg Screwfix) to sell their boilers to installers. Installers then supply and fit boilers to end customers which include homeowners, building owners and housebuilders. Wholesalers may be used as an intermediary for specialist products and for smaller stockists. Stockists operate with a “list price” for a product and trade customers are then offered a discount off this price. Price can be described as a Suggested Selling Price (SSP) or a Recommended Retail Price (RRP). The merchant publishes one Price List and then each customer can calculate their own buying price based on their discount. Historically popular with plumbers’ and builders’ merchants who can offer better buying terms for plumbers/builders and housebuilders who buy a bigger volume from them. The price that anyone pays will be displayed. There may still be better prices for buying in volume. Popular with purely online retailers. Figure 3 illustrates the typical way plumbers’ and builders’ merchants have operated with List Prices or Suggested Selling Prices (SSP). Let’s assume a manufacturer develops a new boiler. They suggest that based on the features it offers compared to other boilers on the market, its price to the homeowner should be £1,200 inc VAT (£1,000 ex VAT). To encourage a stockist to stock and sell this product, the manufacturer offers say a 50% discount off the SSP so the stockist buys it for £500 ex VAT. The stockist price list still shows the price of the boiler at £1,000 ex VAT. 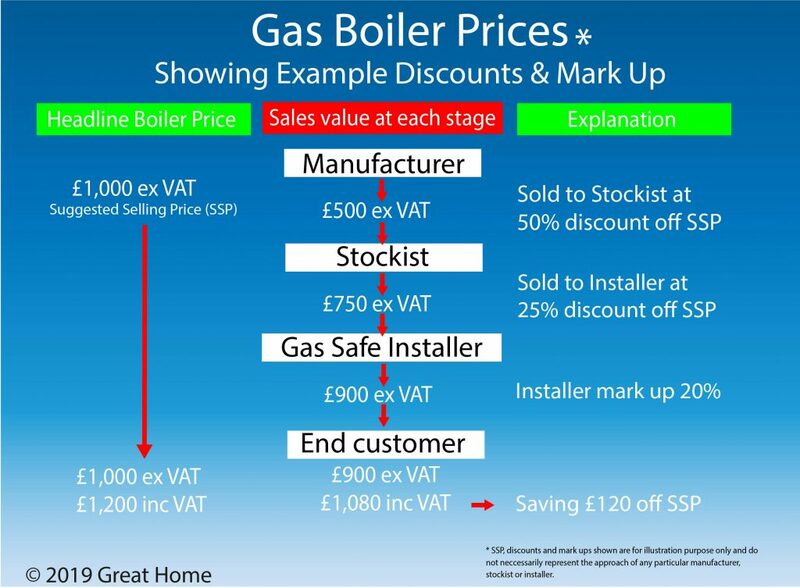 An installer knows that they get say a 25% discount off prices in the price list and they can buy the boiler for £750 ex VAT. 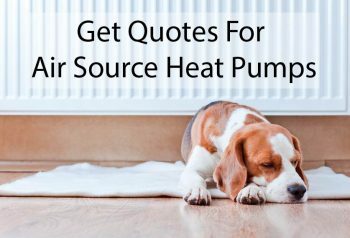 When quoting the homeowner, the installer needs to mark up the price they paid for the boiler, to cover the costs of handling it and resolving any problems encountered, such as missing or damaged parts. In this example the installer applies a 20% mark up on the boiler (adding 20% to the boiler price) meaning they charge the end customer £900 ex VAT or £1,080 inc VAT. This still gives the customer a £120 saving (10%) on the SSP. Note this is an illustrative example only. Each manufacturer, merchant and installer operates in a fiercely competitive environment and discounts and mark ups will vary. No one will be willing to admit what their own buying prices are, or the lowest price they would sell the boiler for. However long term for each to stay in business they do need to make a profit. If you are a big housebuilder putting thousands of boilers in homes every year you can negotiate better prices than a homeowner replacing one boiler once every 15 years! With the development of the internet, online stockists grew up, offering greater transparency on pricing and allowing installers and consumers better visibility of boiler pricing. Merchants realised that their list price with discount structure did not work particularly well for shoppers making online comparisons and have responded in different ways. Some show an online price on their website but encourage installers to login to their account to see their “account price”. Sometimes the online displayed price seems ridiculously high, other times it may be quite competitive. Sometimes merchants take a mixed approach, offering competitive net prices on some popular boilers on their websites to attract online custom, but with the majority still only visible when an installer has logged into their account. Most homeowners deal directly with a Gas Safe registered installation company when looking to replace their gas boiler, rather than trying to buy the boiler themselves from a stockist. There are several benefits to doing this as shown in Table 1 below. Whilst it can be tempting for a homeowner to buy a boiler directly from a stockist, based purely on price, there are some downsides to using the installer just for their labour. If the boiler is defective or damaged in any way on delivery, then the responsibility is on the homeowner rather than the installer to sort this out. Any early warranty claims would also need to be handled by the homeowner. Also, as we will see when looking at Boiler Packs later, the savvy installer can probably offer a better overall price for the boiler and associated parts than an individual homeowner can find on their own. Installer responsible for resolving delivery problems or missing parts. Installer recommends boilers they have confidence in. Installer should have access to better buying prices, saving a consumer money compared to buying direct. Manufacturers offer free extended warranty via their registered installers. We all know that the price a retailer offers today on a product may be different tomorrow. Boiler manufacturers may offer price and other incentives to a stockist to take more stock and stockists may pass this on “whilst stocks last” to installers. If a stockist doesn’t take part in the manufacturer’s promotion, then they may be slightly less price competitive on a particular boiler for a period of time. Of course, they can often run their own promotions and special offers as well. The installer’s dilemma is they have to provide a written quotation to their customer. The customer may want the boiler installed next week when the price promotion is on, or in three months when the price promotion has finished. Buying the gas boiler itself is only part of what is needed for a replacement boiler installation. With many new boilers it is likely that you will also need a replacement flue. There are also other parts which are essential to earn longer warranty on a boiler. EXAMPLE: Vaillant will extend their guarantee on some gas boilers from 5 years to either 7 or 10 years if it is installed by a Vaillant Advance installer and they use a boiler protection kit. The kit filters out sediment from water returning from radiators to avoid wear and damage to the boiler. All of these could be at different prices, with the different flues and protection kits also sold separately. Price promotions mentioned above may be run on the boiler with a flue, making them cheaper than the boiler in isolation; getting a good deal on the boiler alone but then having to pay extra for the required flue may cost you money! Your Gas Safe registered installer should be more aware of what is required. Drop the price of the boiler to try and clear their stock (or even take the last of the manufacturer’s stock to clear it as an exclusive offer). Increase the price of the boiler (when all their stock is gone) so they don’t sell any more of the boiler. For homeowners if you don’t mind having older technology then you can get a bargain. Watch out for the warranty period though. Cheaper boilers often come with a reduced guarantee period compared to better designed boilers; once a range of boilers becomes obsolete it can be harder to get some of the spare parts for it. When a new range of boilers comes onto the market not all stockists will stock it, making it hard to “shop around” until it is added to stockists’ computer systems and the level of demand for it is established. Assuming the new boiler replaces an older model it is likely to be more expensive, at least to start with, because of the price premium charged for additional features. 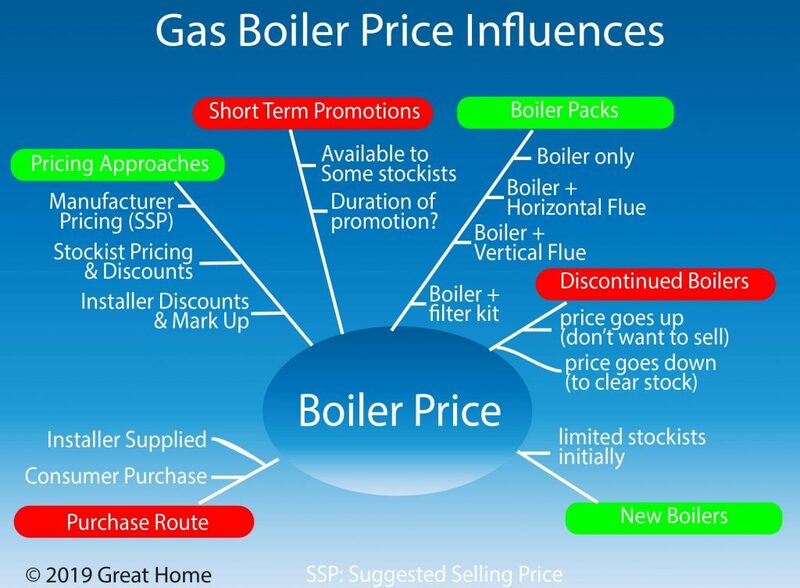 We hope you have found this overview of gas boiler pricing useful and that it has helped build understanding of why a new boiler cost can vary from stockist to stockist. To find out what a replacement boiler installation may cost overall try our Replacement Boiler Cost Online Calculator. 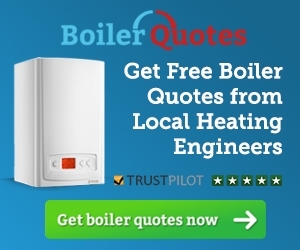 If you are looking for typical prices available for specific boilers explore the Heating Suppliers page, which gives links to pricing information for different manufacturers and types of boiler.